Was there such a thing as International Relations in the Middle Ages? Scholars of International Relations (IR) have usually not paid much attention to the medieval era, but in his new book Theorizing Medieval Geopolitics: War and World Order in the Age of the Crusades, Andrew Latham offers a re-interpretation of late-medieval European states and warfare. 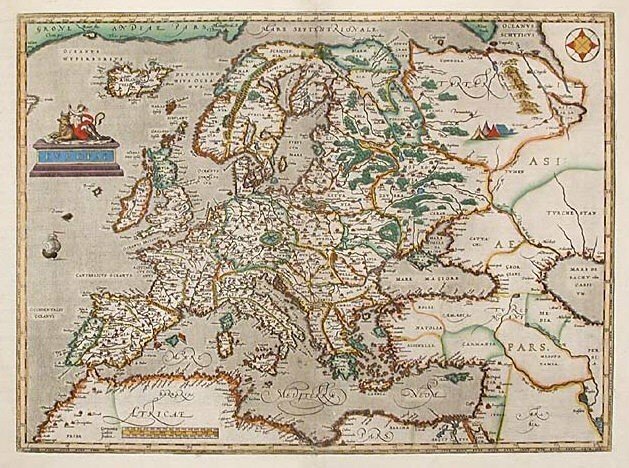 Latham, Associate Professor and Chair of International Relations and International Security at Macalester College, was interviewed us about his research on medieval geopolitics. I think you have two audiences in mind when writing this book – to talk to medievalists about international relations, and to talk to International Relations scholars about the Middle Ages. What were the main messages you wanted to send to each of these groups? Actually, my main goal was to get the International Relations (IR) community to move beyond the othering and exoticization of the Middle Ages and to accept that the late-medieval international system was, in fact, an international system and thus worthy of being studied by IR scholars. The prevailing common sense (in IR at least) is that this was an era of non-statist “feudal heteronomy”, radically distinct from the early modern international system that superceded it sometime between the mid-sixteenth and mid-seventeenth centuries. According to this view, the late medieval translocal order was not an international system, properly understood, for the simple reason that it did not comprise sovereign states interacting under conditions of anarchy. Rather, or so the conventional wisdom has it, the late medieval world was populated by a wide range of qualitatively distinct types of political unit – the Church, the Empire, kingdoms, towns, urban leagues, feudo-vassalic networks, etc. – interacting within a variety of hierarchies (feudal, legal, cosmological), and operating according to a non-exclusive territorial logic. On this view, sovereignty, a key requirement for the emergence of both the state and state-system proper, did not make its historical appearance until very late in the game when it was “invented” by early modern thinkers such as Machiavelli or Bodin or Hobbes. While some scholars – Hendrik Spruyt, for example – are willing trace the origins of the sovereign state back to economic developments in the thirteenth century, almost none are willing to argue (or even accept) that long before Westphalia or Augsburg a historically distinct but recognizably inter-state system was operating within Latin Christendom. My objective in writing this book, however, was to demonstrate that this is a deeply flawed characterization of late medieval world order, one largely without warrant in the contemporary historiographical literature. By the mid-thirteenth century, the convergence of new or revived discourses of sovereignty, territoriality, public authority, the “crown” and political community had given rise to a new “global cultural script” of sovereign statehood that was being enacted on various scales, around various social forces and through various institutional formations in every corner of Latin Christendom. Across the region, political authorities – whether imperial, royal, princely or municipal – promulgated new laws, extended and consolidated their judicial capacities, developed new and more effective means of extracting taxes and other revenues, improved and extended the mechanisms of public administration and record keeping, and developed ever more extensive networks of patronage and influence. To be certain, these developments unfolded differently in different contexts, resulting in the emergence of a number of distinctive types of forms of state: the Empire was different from kingdoms such as Sweden, France or Aragon, and these differed not only from each other but from principalities such as the Duchy of Brittany, city-states such as Venice, the Papal States, and the Baltic ordenstaat ruled by the Teutonic Order. But this diversity should not conceal the fact that a common, historically specific script of statehood was being enacted across Latin Christendom. Expressed in the language of IR theory, the various forms of state that were crystallizing during this era may have been structurally differentiated, but they were functionally isomorphic (in terms of their common constitutive ideal and its practical expression). Ultimately, they were all states – distinctively late medieval states to be sure, but states nonetheless. Attempts to reserve this label exclusively to kingdoms such as England and France and to characterize other forms of polity (the Empire, principalities and urban communes) as being somehow categorically different (i.e. as something other than states) is simply, I argued, to misunderstand the “state of the state” in the late Middle Ages. bring into focus what I think is the key factor contributing to the rise of what we have agreed to mischaracterize as the “sovereign state” (actually the triumph of the kingdom) in the early modern era: the emergence of the constitutive ideal of the “corporate-sovereign state” that came to dominate the political imaginary of Latin Christendom by the thirteenth century. Somewhat more specifically, I suggest that the kingdom triumphed over other forms of polity in the sixteenth century for the simple reason that the constitutive discourse of the corporate-sovereign state that emerged in the thirteenth century privileged this political form over all others, ultimately enabling those enacting the script of the kingdom to displace or subordinate those enacting rival scripts of statehood. In essence, I argue, the constitutive ideal of the corporate-sovereign state distinguished the kingdom from other lordships and principalities and vested it with a legitimate claim to jurisdiction over all other temporal powers within the imagined “historical” boundaries of the kingdom. As a result, when these various state-building projects collided, the kingdom nearly always had a substantial normative advantage over its competitors: whether in the context of legal proceedings, diplomacy, mediation or war, the claims of the kingdom were almost invariably considered to be more legitimate than those of lesser powers. To be sure – and I am at pains to point this out in the book – this advantage did not always translate into immediate political success; the material capacity to enforce or defend jurisdictional claims also mattered greatly, as did the ability to mobilize economic and martial resources in pursuit of these claims. And even when kingdoms did manage to bring other states into their constitutional folds, they often did so (initially at least) on the basis of political bargains that reserved to the subordinate state substantial “liberties” and rights to self-government. Even so, reviewing the history of the “making of polities” between the twelfth and sixteenth centuries it is difficult to avoid the conclusion that the genotypically superior kingdom was “destined” to triumph sooner or later over its competitors. The framing of the ideal of the kingdom as superior to its competitors invested the efforts of those states to assert jurisdiction and sovereignty with a degree of legitimacy that made them difficult – and ultimately impossible – to resist. Over time, I argue, it was the non-linear working out of the constitutive ideal of the corporate-sovereign state that resulted in the triumph of the so-called sovereign state and the birth of its associated international system or society in the seventeenth century. A significant portion of this book deals with how to apply international relations theory to religious wars, such as the crusades. Why has the crusades been “a significant unresolved puzzle for IR theory”? Having made the argument for the “primacy of the political” when discussing the making of polities, I also argue in the book for “the primacy of the religious” when it comes to explaining the actions of the Church. The Church during this era was not motivated primarily by power-political considerations or by the logic or social property relations; rather, it was motivated by a particular set of religious self-representations and an entailed set of core values and interests. While other motives intersected with and inflected these core values and interests, they were decidedly secondary in nature. The principal condition-of-possibility for the religious wars of late-medieval Latin Christendom was the religious identity-interest complex of a religious institution and the structural antagonisms this complex generated with other actors within and beyond the Latin Christian world order. Similarly, while kings, princes and lords may to some degree have had more mundane interests related to the pursuit of wealth, their primary motives in “taking the cross” were religious in nature. The “language” of religion – in the sense intended by Quentin Skinner when he coined the phrase “the language of politics” – used to explain and justify crusading on the part of temporal actors was neither a smokescreen for “deeper” motives (political or socioeconomic) nor some sort of false consciousness. Instead, it was both a Skinnerian “discourse of legitimacy” that constrained actors and a Wendtian core identity that motivated them. To answer your question directly, this has important implications for the field of IR. I am not the first scholar, of course, to call for religion to be brought into the study of international relations. As Elizabeth Shakman Hurd and others have commented, the field of IR has too long operated on the basis of some very modern (and largely unexamined) secular assumptions – assumptions that have largely blinded us to the role of religious belief and identity in global political life. Nevertheless, one of my motives in writing this book was to add to this rising chorus my own particular plea that the field pay more attention to the way in which religious belief and identity constitute actors on the international relations stage. My analysis of the crusades demonstrates how a distinctively religious “identity-interest complex” made possible the religious wars of the late medieval era. This is a very specific historical case, to be sure, and I have endeavored to present it as such. But there is no reason to suppose that the argument that religious identities (along with all of their entailments) cannot and do not motivate individual and collective actors on the international stage just as powerfully today as they did a millennium ago. Indeed, as the works of scholars such as Olivier Roy and David Cook convincingly demonstrate, historical and contemporary Islamist political violence – to take one particularly salient example – is both made possible and motivated by a particular religious identity and its associated political project. Like the crusades, this violence cannot be convincingly explained by recourse to the “hidden logic” of the mode of production, the transhistorical logic of self-help under anarchy, or “second image” dynamics that explain violence in terms of the war-prone pathologies of certain actors on the international stage. The crusades were not the product of feudal social property relations, power-political calculations, or the inherent bellicosity of Latin Christians; and contemporary global jihad is, likewise, not the product of economic underdevelopment in the Islamic world, “Islamophobia” and anti-Muslim sentiment in the West, or the inherent bellicosity of Islam or Muslims. In both of these cases, the well-spring of religious war is twofold: first, a religious identity-interest complex that constructs the Self as being a divinely inspired instrument of “reform” and “justice” and the Other as being in some way inherently antagonistic to this “sacred” project; and, second, a cultural discourse that constructs religious war as a legitimate institution and the religious warrior as a legitimate actor (at least in the eyes of some significant portion of the relevant population). There are differences, of course, and I wouldn’t want to press the parallels too far. But the basic point is that in both cases, the language of religion was not a smokescreen for real (socioeconomic) motives; it was a window on the real (religious) ones. The bad news is that we IR scholars still haven’t seriously embraced religious identities as causal variables, especially when it comes to explaining organized violence; the good news is that, as constructivist IR scholars already have tools to tackle issues related to the identity-interest nexus, the barriers to “bringing religion in to international relations” are relatively low. What kind of response have you received to your idea that international relations should consider the year 1200 to present as a kind of single period? The book has been very well reviewed by some important IR scholars. Andrew Linklater, to take but one notable example, deemed it “courageous and innovative”; and a few others have communicated a positive assessment, either publicly or privately. More broadly, though, I think the response can best be characterized as one of deafening silence broken only by the periodic thunder of intense opposition. Amongst the primary target audience of IR constructivists, the Great Divide thesis (and its corollary that there were no states or state-system prior to the modern era) serves simultaneously to challenge the transhistorical claims of the realists (the timeless logic of realpolitik) and to lay the predicate for the constructivist argument that we are not on the cusp of another Great Divide (this one associated with the modern-to-postmodern transition). Add to this the fact that so many constructivists have uncritically predicated their own scholarship on a profoundly Orientalized and exoticized version of the Middle Ages and it is easy to see how unlikely it is that any one book will effect a kind of Copernican revolution in the field. And, to be honest, I never imagined that my book would do so. More realistically, my hope was, and remains, that my study will simply provide a counternarrative to the conventional wisdom. If down the road this counternarrative encourages a few graduate student to push past the Othering and orientalization of the medieval era that so thoroughly permeates the IR common sense to reflect on the actual ideas, institutions and interactions of the period, that will be more than enough for me. What other projects are you working on that will be of interest to medievalists? Believe it or not I’m preparing for the release (in 2015) of my new novel The Holy Lance. Set in the Third Crusade, this is the story of the exploits of a small band of Templars on a mission to recover an important religious relic. While on one level it is a work of genre fiction, in a deeper sense it is really about the way in which Templars (and indeed members of the other military orders) sought to reconcile the two core dimensions of their personalities: the brutal warrior and the pious monk. It is also focused on telling the truth about the Crusades (which I discussed at length in Theorizing Medieval Geopolitics) and the Templars (which I did not). In this latter regard, I’m honored that Malcolm Barber (yes, that Malcolm Barber) has reviewed the book for historical accuracy and given it a thumbs up. Beyond the novel (well I’ve actually been contracted to write a series of novels) I’m currently working on an article debunking the notion of heteronomy. My model here is Elizabeth A. R. Brown’s classic article “Tyranny of Construct”. My goal is to do for the construct of heteronomy what Brown tried to do for the construct of feudalism. Might not be of interest to medievalists (though it might), but I’m hoping it’ll ruffle at lest a few feathers in the IR world.